This is a Test arrangement for Leakage Testing of Diodes on Reverse Bias. The leakage current indicates the ability of the diode to withstand higher voltages. An AutoTransformer or Variac can be used to vary the test voltage. Even Plastic capacitors can be tested for leakage this way. Use a Isolation 1:1 transformer for safety. This circuit has to be enclosed in a insulated cabinet. A Jig or Acrylic Safety Plate with clamp can be used to connect the diode. The voltage is only applied as long as a Mains two way push switch is pressed. This adds to the safety. 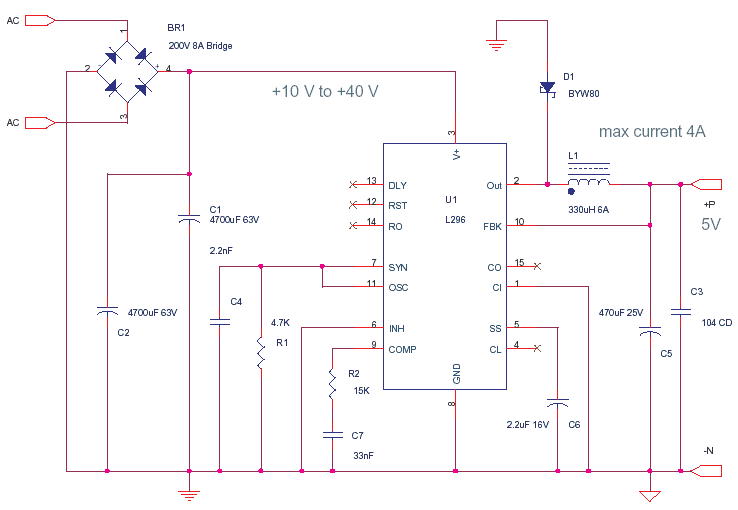 This circuit is derived from an application note of L296, It is a Power Switching Regulator from ST. The advantage of using a switching regulator is that there is not much Heat Dissipation in this circuit. If you had to build the same with a series regulator, it would be very big due to external transistor and a huge heat sink. This circuit takes a small place on PCB, efficiency is high so power is saved and reliability of product improves, lastly the thermal gradients within the cabinet is avoided so that any form of drift or component specs variation can be avoided. L296 and L296P are stepdown power switching regulators 4 A at a voltage variable from 5.1 V to 40 V. External programmable limiting current. Soft start, remote inhibit, thermal protection, a reset output for microprocessors. The Schottky rectifier BYW80 is used as it switches very fast 200V-20A-35nS. The Inductor and Capacitor is for the filter to get a ripple free DC from the Chopped DC output. There may be a small high frequency ripple riding on the DC signal of 5V in most SMPS circuits. So for very sensitive circuits use extra filters and shields. The Current output is limited, and can be reduced further with a resistor from Pin 4 to ground. Also if the feedback to Pin 10 is thru a Voltage Divider then more voltage can be set at the output. See the datasheet and application notes for other design details and circuits.